Fantastic new Cruise/Tour Combo, truly the best of the Balkans! This spectacular comprehensive Grand Balkan Tour/Cruise combo encompasses the entire Balkan region in one fabulous experience! Start in Dubrovnik, then down to Montenegro, Albania, Macedonia and back to finish in Dubrovnik. Then join your fabulous round-trip cruise of the Dalmatian coast and island hop your way through the Adriatic. 15 days from Dubrovnik, Budva (Montenegro), Shkodra (Albania), Tirana, Ohrid (Macedonia), Skopje, Kolasin (Montenegro), Cetinje, Kotor and back to Dubrovnik (7nts tour), then cruise for 7 nights! 15 days from Dubrovnik, Budva (Montenegro), Shkodra (Albania), Tirana, Ohrid (Macedonia), Skopje, Kolasin (Montenegro), Cetinje, Kotor and back to Dubrovnik, then Korcula, Hvar, Split, Omis, Bol, and back to Dubrovnik. Open age cruise/tour combo. Double/twin cabins on Upper, Main and Lower Deck. Triple cabins are a double bed with a single bunk bed above. Solo travellers must book a double/twin for solo use with a solo use supplement. MS Princess Aloha Main Deck has Twin bed cabins only, both DBL and Twin available on Lower Deck. Morning sightseeing tour of Tirana, the capital of Albania, including Skender Bey Square, the Mosque of Ethem Bey and a visit to the National Museum representing the flow of Albanian history and housing the finds from archeological sites across the country. Afternoon departure for Ohrid, driving via Elbasan and crossing the Macedonian border at Cafasan. Dinner and overnight in Ohrid. Full day in the lakeside resort of Ohrid, classified as UNESCO’s World Cultural Heritage site. Through the activity of St. Clement and St. Naum of Ohrid, the first pan-Slavic University in Europe, the famous “Ohrid Literary School” was founded here. Morning sightseeing tour includes the church of St. Sofia (11th century), the most eminent mediaeval monument in Macedonia with magnificent Byzantine fresco paintings and St. Clement Church with its icon of Annunciation. In the afternoon a short drive to visit St. Naum Monastery built on the shores of Ohrid Lake in 900 A.D. and dedicated to the Slavic missionary and educator St. Naum of Ohrid. Return to hotel for overnight. Morning departure for Skopje. Sightseeing tour of Skopje, including the Kale Fortress, the Church of the Holy Savior with its iconostas, one of the finest samples of traditional walnut woodcarving, Old Bazaar and Stone Bridge. We drive to the slopes of the Vodno Mountain where we visit the Monastery of St. Panteleimon with its 12th century iconostas and frescoes ranking among the highest achievements of Byzantine art of this period. Dinner and overnight in Skopje. Morning departure for Kolašin, driving via Peć and Berane and along the impressive Morača River Canyon. Afternoon arrival at Kolašin, spreading on the left bank of the river Tara, situated at the altitude of 954m. The whole area is surrounded by the thick pine forest of the Bjelasica Mountain and is a popular skiing and air spa resort. Dinner and overnight in Kolašin. Breakfast at hotel. Afternoon transfer to the boat. Embarkation at Gruž port. Meet your fellow travelers and your Cruise Manager later at an on-board Welcome Reception. This evening, you can relax or take a walk through Dubrovnik’s vibrant streets. Overnight on-board the boat. We set sail for the island of Korčula around two o’clock, with swimming stop, if weather permits, in one of pristine bays, time to cool off, relax and lunch onboard. Continue towards Korčula, the most preserved medieval town whose street design is based on a fish bone pattern, to spend the night there. This morning, a walking tour of Korcula takes you through its narrow, cobbled streets full of history. Later in the morning we set sails towards the island of Brač, village of the stone sculpture and music culture Pučišća, where you can visit amazing stonemason school (optional). Lunch on board. Enjoy a swim in one of Brač’s many lovely coves and bays, if weather permits. Emperor Diocletian’s Palace. The historical center of the city is listed as a UNESCO World Heritage site. Your evening is free in Split. 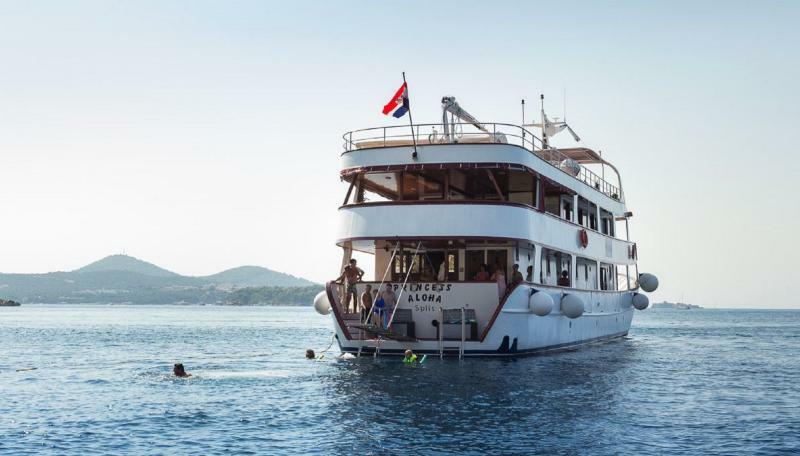 The MS Princess Aloha is classified as a 125 ft. long, 26 ft. wide 5 star vessel, with a cruising speed of 9 nautical miles. This is a 2012 built ship with all the latest equipment. Its maximum passenger capacity is 38. It offers 18 cabins with twin or double beds; some with possibility for an additional bed. The Sun deck has a total surface of 2,368 sq. ft., partially offering sun-shade cover and providing deck-beds for all passengers. The ship has a rear access platform to the sea as well as ladders for easy access to the water. In addition, the vessel offers two outdoor showers and four deck lavatories.